THIS IS WITHIN THE 48 STATES (and some parts of Canada), TO A BUSINESS WITH A DOCK OR FORKLIFT FOR UNLOADING! 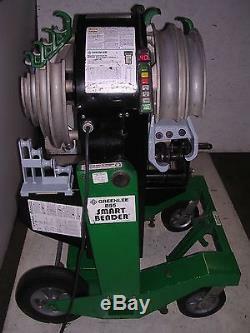 THIS IS A USED" Greenlee 855 Electric (110-120 volt) QUAD SMART Conduit Pipe Bender in "EXCELLANT CONDITION" for 1/2" to 2 Conduit EMT, IMC, RIGID & ALUMINUM pipe! IT WILL BEND 1/2", 3/4" 1", 1-1/4", 1-1/2" and 2" EMT, IMC, RIGID, ALUMINUM AND PVC COATED CONDUIT (you need an additional shoe group for pvc coated)! THIS WILL BEND ALL SIZES WITH NO SHOE CHANGES!!!! IT WILL ALSO BEND IN HORIZONTAL OR VERTICAL POSITIONS... It works very well, it is smooth and quiet. It has Forward/Reverse or Load/Unload! It also has a programmable pendant for repeat bends and has a magnetic strip to attach to any metal surface (see pic's). 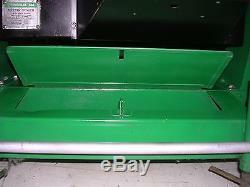 It also has a built in tool box (for manual and remote). 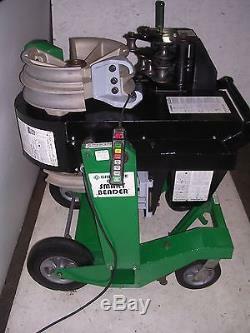 This unit is USED and is in "EXCELLENT" condition! This unit has original paint, but has been touched up where needed! An instruction manual is also included! 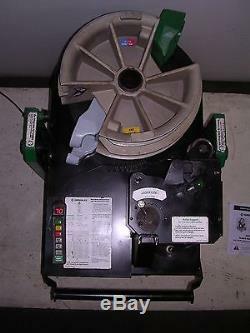 So you, or your employees can make quick, exact bends! This is the original model just before they changed the 855 completely! The new 855's don't do 1/2" or 3/4" conduit, this unit does! Crazy and doesn't make any sense! GET OUT OF THE PAST! THEN YOU HAVE TO CHANGE THE SHOES 5 DIFFERENT TIMES TO COVER THIS RANGE. 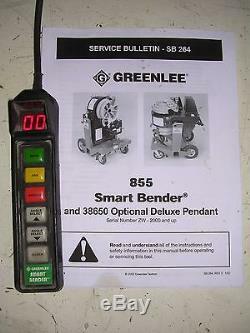 See comparison chart below to see how many features this unit has compared to a Greenlee 854, 853 & 555! 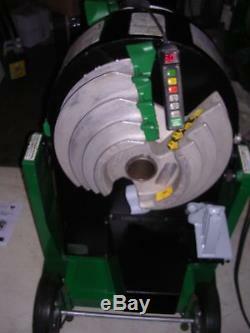 Quad-Shoe & Patented Roller System. 1", 1-1/4", 1-1/2", 2" shoes. 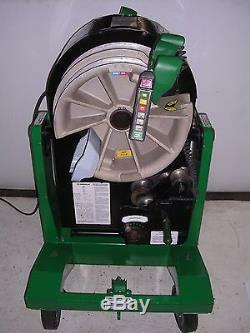 TO SEE THIS UNIT NEW...... THEN CHECK OUT THIS USED UNIT.... YOU WILL DROOL AT WHAT YOU CAN DO AND THE GREAT PRICE! 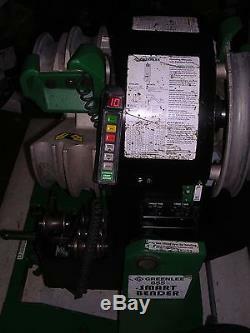 WE ALSO HAVE RIDGID BRAND PIPE THREADERS 300's, 1822's, 1224's, 535's, ETC. Add a map to your own listings. The item "GREENLEE 855 555 QUAD SMART Conduit Pipe Bender 1/2-2 EMT RIDGID IMC ALUMINUM" is in sale since Friday, March 11, 2016. 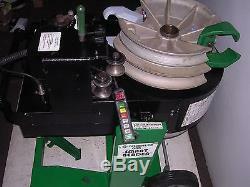 This item is in the category "Business & Industrial\Light Equipment & Tools\Pipe Tools\Pipe Benders". 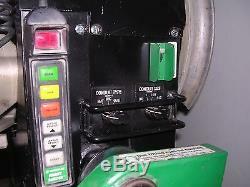 The seller is "sr6933" and is located in 80 Miles West of Chicago. This item can be shipped worldwide.